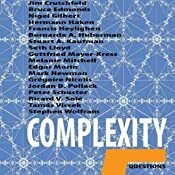 This book poses five questions about complexity to 24 researchers who are relatively prominent in the field (but of course some key people are still left out). The five questions are: (a) Why did you begin working with complex systems? (b) How would you define complexity? (c) What is your favorite aspect/concept of complexity? (d) In your opinion, what is the most problematic aspect/concept of complexity? (e) How do you see the future of complexity (including obstacles, dangers, promises, and relations with other areas)? The combined length of the responses to all five questions for each researcher/contributor ranges widely, from only a little more than 1 page to more than 10 pages. As one might expect, the shorter responses are too short to be of much use, whereas the longest responses perhaps go into too much esoteric detail, but most responses are fortunately somewhere in the middle. Also, oddly, one researcher (Edgar Morin) doesn't even follow the format of the five questions, and instead just provides a convoluted little essay of less than 2 pages. (1) Almost by definition, the study of complex systems involves recognition that reality isn't necessarily simple (or amenable to representation with simple models). In this regard, on a philosophical level, there's the question of whether perceived complexity is ontologic (objectively real) or merely epistemic (and thus contingent on our models). Personally, I'm not sure that this question is answerable even in principle (relates to the philosophical question of scientific realism), and maybe it doesn't need to be answered from a pragmatic standpoint. (2) At least epistemically, complexity is ubiquitous, perhaps increasingly so, and thus the study of complex systems is practical, if not essential (especially in biological and social realms). In this regard, it's debatable whether current systems biology adequately deals with complexity versus being just another reductionistic approach. (3) Complex systems have sets of interacting (and possibly interdependent) elements, and thus tend to form networks. Often, the specific characteristics of the elements have only limited effect on the overall system behavior. (4) Complex systems tend to behave nonlinearly rather than linearly (in terms of response to inputs), and tend to have feedback loops. (5) Complex systems are usually self-organizing, with no central control. (6) Complex systems usually have emergent properties (evident at the system level, but not element level). (7) Systems usually have multiple hierarchical levels which are typically physically distinct and thus readily discernable, and complexity can be found at one or more of these levels. A challenge is choosing the level(s) at which to model a complex system. (8) The behavior of complex systems appears to involve an interplay between randomness and order, and thus predictions regarding the behavior of complex systems may unavoidably have to be probabilistic (at least in some cases). (9) Complex systems tend to be dynamic, adaptive, and evolving (sometimes in surprising ways), rather than moving towards an equilibrium steady state. This evolution can include variation and selection at multiple hierarchical levels (individual elements, groups of elements, network topology, etc.). (10) Complexity suggests that the future may be relatively open, which gives freedom but also limits prediction and control. (11) Study of complex systems fosters development of new kinds of observables. (12) As a tool for studying complex systems, computer simulation allows handling of huge amounts of information and solution of problems far beyond analytical (paper and pencil) limits, even though the underlying models may be complicated and thus difficult to understand intuitively. 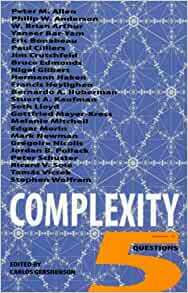 (13) Complexity may be the borderline between simple problems and unsolvable problems. (14) Whether "complexity science" exists or ever will exist as a coherent field is a matter of debate. There's likewise no consensus on a definition of complexity (it may be more a matter of "family resemblance" rather than necessary or sufficient conditions) or whether we will ever discover universal laws of complexity. Nevertheless, there's still real and steady progress in this (proto)field, and studying complex systems both benefits from and fosters interdisciplinary efforts, including philosophical reflection. Overall, I do recommend this book to people interested in complexity, but it's probably best suited for people who already have some familiarity with the subject. If you don't have that background, perhaps a better book to start with is Complexity: A Guided Tour by Melanie Mitchell.